The 43rd Annual TNBA Western Regional Junior Tournament was held April 6-7, 2019 at AMF Monaco in Denver, Colorado. 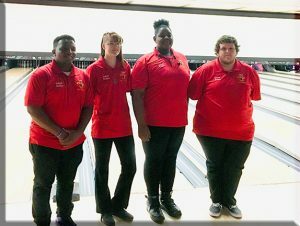 After some great bowling and teams knocking over 34,000 pins, the Inland Empire Senate in Moreno Valley, CA came out on top with a 2784 to win the Western Region Junior Tournament. Inland Empire Senate Division 1 winners will represent the West in the AJR Roll-off in St. Petersburg, Florida on May 9, 2019. 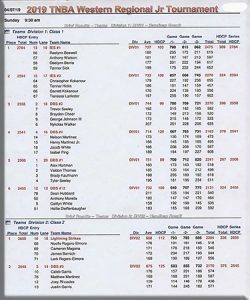 Good job, IES #1 team members Raelynn Boswell, Anthony Watson Deelynn Berrie and Tanner Sisk.